At least five protesters have been killed and hundreds wounded in a crackdown by Bahraini forces on Wednesday, the head of the Shiite Muslim opposition bloc in parliament said. "This is a war of annihilation. This does not happen even in wars and this is not acceptable," Abdel Jalil Khalil, a senior politician in Bahrain's largest Shiite party Wefaq, said. Khalil told Reuters by telephone that, apart from clearing protesters from the Pearl roundabout, troops had fanned out across Bahrain, cutting off streets and arresting or firing at people who tried to cross. Khalil said that private homes and funeral parlors were receiving casualties as troops had surrounded several hospitals and called on qualified doctors to head to their nearest health centre to help treat casualties. Soldiers and riot police used tear gas and armored vehicles to drive out hundreds of anti-government protesters occupying a landmark square in the capital, a day after emergency rule was imposed in the violence-wracked Gulf kingdom. 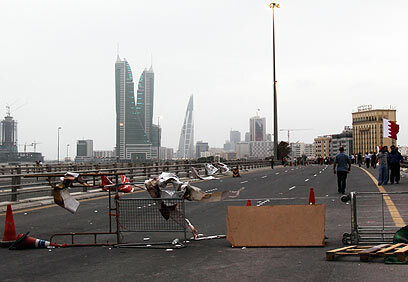 The full-scale assault launched at daybreak swept into Pearl Square, which has been the center of uprising against Bahrain's rulers since it began more than a month ago. Stinging clouds of tear gas filled streets and black smoke rose from the square, possibly from the protesters' tents set ablaze. State TV broadcast video showing military vehicles in the square flying Bahrain's red-and-white flag as security officials moved through the wreckage of the encampment, set up at the base of a towering monument to the country's history as a pearl diving center. The video showed the ground littered with debris, including satellite dishes and charred tent poles. See all talkbacks "Bahrain opposition: 5 dead in 'war of annihilation'"